contest, giveaway, humor, interview, June Kearns, Lie-dar, review, what says home? My review follows, but first please join me in welcoming June. Who would you most like to sit next to on an airplane? I’d like to sit between the Dalai Lama and Pope Francis. All that wisdom and serenity would stop me worrying about being suspended thousands of miles above the earth in the tummy of a big metal bird. Who would play you in the movie? Reese Witherspoon? I haven’t got the looks, of course, but she’s blonde and small, (short legs?!) like me. As a child, what did you want to be when you grew up? A writer! I spent hours copying out pages and pages of my books to see how the authors did it. June’s writing wall of inspiration! What’s the best writing advice you’ve ever heard? 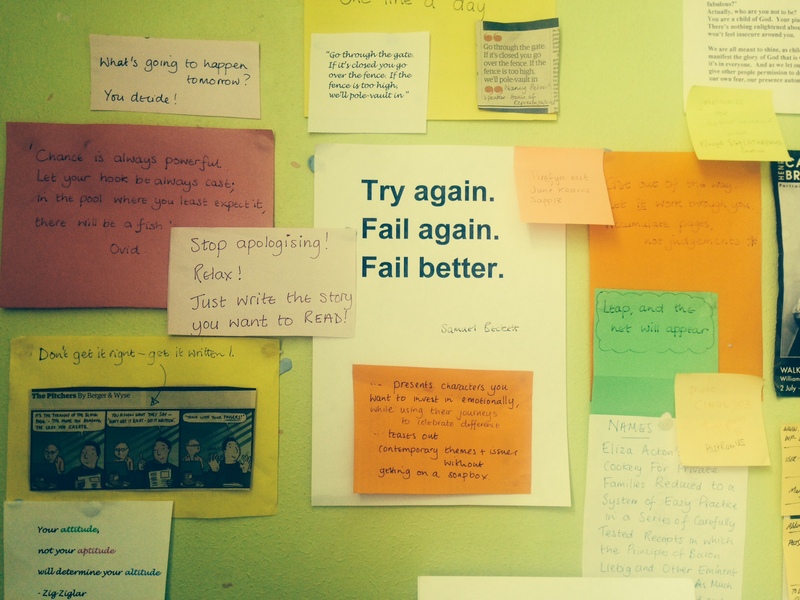 I spend a lot of time staring at the wall in front of my desk – a hotch-potch of writing advice and helpful quotes! One of my favourites: Stop apologising! Relax! Just write the story that you want to READ. Another from Samuel Beckett: Try again. Fail again. Fail better. After a stagecoach wreck, well-bred bookish spinster Annie Haddon, (product of mustn’t-take-off-your-hat, mustn’t-take-off-your-gloves, mustn’t-get hot-or-perspire Victorian society) is thrown into the company of cowboy Colt McCall – a man who lives by his own rules, and hates the English. 1924. The English Shires after the Great War. When her jazzing flapper of an aunt dies, Gerardina Mary Chiledexter inherits some silver-topped scent bottles, a wardrobe of love-affair clothes, and astonishingly, a half-share in a million-acre cattle ranch in south-west Texas. Haunted by a psychic cat, and the ghost voice of that aunt, Leonie, Gerry feels driven to travel thousands of miles to see the ranch for herself. Against a background of big sky, cattle barons and oil wells ,she is soon engaged in a game of power, pride and ultimately love, with the Texan who owns he other half. Review: 5 of 5 stars for both The 20’s Girl, the Ghost, and All That Jazz, and An Englishwoman’s Guide to the Cowboy. It’s funny. Reading June Kearn’s books feels like coming home. Home to old-fashioned glamour, romance, and love stories. That’s why when I went to write about them, I was so surprised to realize that these books are like nothing I’d ever read before. Her heroines are in the fine old tradition of (strait-laced/gloved/hatted/tea-drinking/chat-about-the-weather-then-indomitably-triumphing-over-evil-doers-or-the-ill-bred) British ladies. Her heroes are… not. Tall, taciturn, moody-bordering-on—and often achieving—rude, they could just be another iteration of Rose Sayer vs Charlie Allnut from The African Queen, where Hepburn’s proper British spinster meets Bogey’s gin-swilling reprobate. But there’s more going on in these books than a clash of cultures. In An Englishwoman’s Guide to the Cowboy, corseted, gloved, proper Victorian British spinster Annie Haddon is the poor relation who is never allowed to forget the debt she owes her relatives for taking her in and raising her. All that changes when her aunt insists on a trip to the American west, only to have the stage they’re riding in come under attack. Rescued by cowboy Colt McCall, Annie finds her growing appreciation of the wide open landscapes around her includes the tall half-native-American cowboy in front of her. 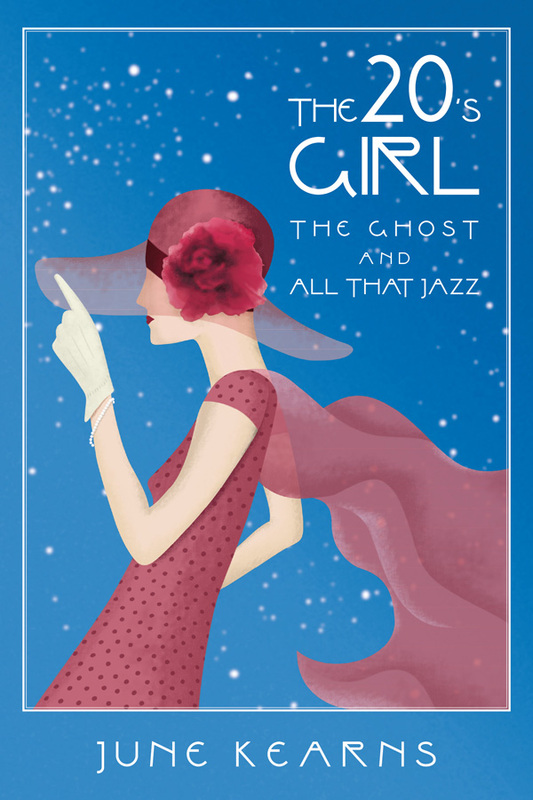 In The 20’s Girl, the Ghost, and All That Jazz, Gerardina Mary Chiledexter is coping with the death of her beloved guardian, the enchanting, glamorous, improvident Leonie who left her a bookstore and a mountain of debt. Her world, the tiny irresistibly-named Lower Shepney Market, is still reeling from the Great War, so eligible marriages that might have defined her future are not possible. The bookstore faces financial ruin, and she’s about to lose her home when she discovers that she’s the half-owner of a ranch in Texas—to the annoyance of her co-owner Coop. As I read Gerry and Annie’s stories, I realized that they are about more than the clash of differing cultures. They are even about more than ‘opposites attract, fight, kiss-kiss, and ride into the sunset’. Those stories are fun, but we’ve all heard them before. No, what June Kearns investigates—in the lightest, most entertaining, often laugh out loud funny way—is what home means. Annie, Colt, Gerry, and Coop are all people who are in some way cut off from their own place. Each is surrounded by the world they grew up in, but not defined by or ultimately at home in that world. In Kearns’ books, that search for a home that accepts you for who and what you are defines and motivates the characters. Sometimes, of course, those characters get it wrong. But luckily for them, Kearns’ books also have enchanting hints of supernatural spirits or even grumpy cats who don’t hesitate to point out their charges’ mistakes and nudge them back to the path to happiness. Having made the reverse of her characters’ westward journey—I moved from the American west to a tiny English village—I was captivated by both the loving descriptions of English village life and the admiring pictures of the American west. Arguably, neither world still exists, but through these books you see not only those places, but the way they define and inform their modern day equivalents. You still can attend an afternoon cricket match that lasts the whole day, or ride a horse for hours across a western landscape. And the best part? Kearns accomplishes all of this so lightly that you never feel her touch. Her books’ dialog sparkles, her descriptions of the two different worlds have you picturing western expanses and British teas, and her pacing is perfectly timed to deliver her characters to their combined British/American just desserts. That’s y’all done. Cheers. An only child, I was a terrible day dreamer, who used to spend a lot of time just staring into space and making things up. At quite an early age, I remember copying out pages and pages of Enid Blyton to see how she did it! My newest novel, The 20’s Girl, the ghost, and all that jazz was inspired by the style and fashion of the 1920’s, and that time in England after the Great War, of crumbling country houses and very few men. 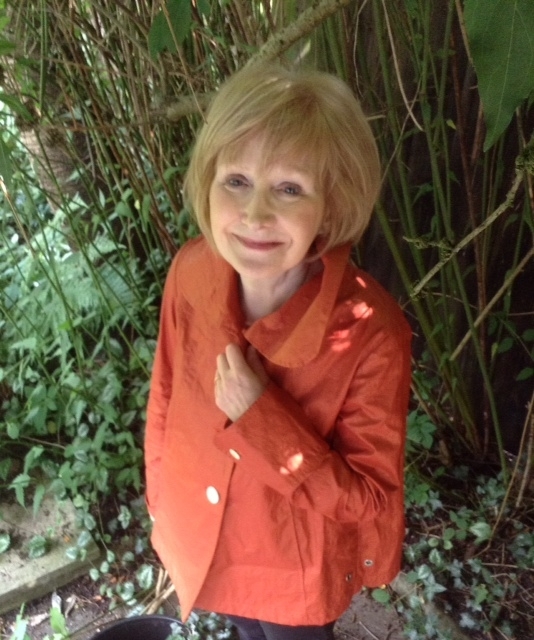 A co-founder of the indie publishing group The New Romantics 4, I live in Leicestershire with husband and family. Washing up at a motorway service station. Standing in the street dressed as a tomato to advertise a new brand of sauce. Stumped? For a bonus chance to win, tell us—What is the one thing that says “home” to you? Gosh, Barb – thank you so much for those wonderful in-depth reviews and a great shout-out. Two great novels and a fabulous blog. Now, I already have June’s books but I’m guessing that sitting in a sweet factory wearing a turban was her worst job. Am I right? Or am I right! What a fabulous interview and in depth review of June’s books, I couldn’t agree more, I’ve read both of them and loved them just as much, really do recommend them as brilliant reads. Lovely comment – thanks Jan! A great review and a wonderful post. Check it out! Glad you liked it, Ionia – it was fun to do. Hello again June. This is another wonderful exciting blog interview. I’m guessing it was sitting in a sweet factory. All the best with the move!! Great interview June! Except Rosie’s wonderful tour where we both were guests, I find here more about you. Best of luck with your writing! Thank you, Carmen, for great support on both blogs. It’s been so nice to meet you! Escellent intereview and such good advice. I’ve read 20’s Girl and can thoroughly recommend it. As for the quiz, I can just see June dressed as a tomato, so would go for that, whether it’s true or not! Good luck with the next book. Thank you, Lilian – not quite sure what you mean about the tomato! What great questions and answers. It gave a lovely peak into June Kearn’s life. I am a great fan of her writing too and was really surprised to read that she had not visited Texas. I assumed that she was writing from experience as the sand, heat and wind of the Texas plains almost blew out of the book as I turned the pages! I’m really looking forward to her next book. It was bit of a relief to hear Barb’s opinion of the landscape scenes. They’re in my head, but she’s seen it for herself! Oh my gosh, the Harrison Ford clip is hilarious! At first I was all upset and sad for how much he didn’t want to talk about it! I’m an idiot. Ha. One of the million things I love about you Aussa is that you’re the only one besides me (so far) who thinks that clip is hysterical. That love affair with him? Think it’s finally over, Barb. Sigh. Hi, Barb! Thanks for introducing me to June Kearns. 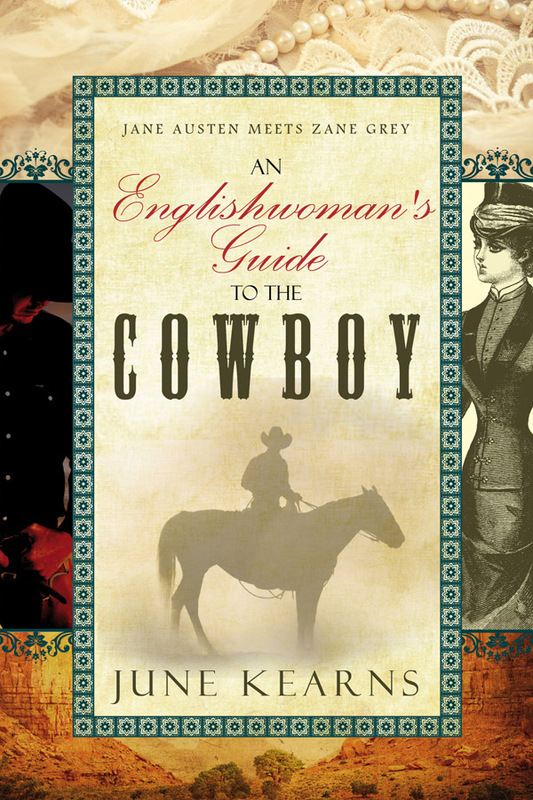 Those blurbs have piqued my interest and I would pick up one of the books soon, maybe ‘An Englishwoman’s Guide to the Cowboy’: I like the idea of an Englishwoman pitted against a cowboy. Incidentally, I’m also a mighty fan of both Star Wars and Harrison Ford. Many thanks for checking out my story, too.